* 본 제품은 기존 SMARTer® ThruPLEX® DNA-seq Kit (Code R400523)의 업그레이드 버전 제품이며, indexing primer kit가 포함되어있지 않습니다. SMARTer® ThruPLEX® DNA-seq Kit은 SMARTer® ThruPLEX® 기술을 이용하여 극소량의 DNA로부터 Illumina® NGS Library를 제작할 수 있는 제품이다. 본 제품을 이용하면 불과 50 pg 수준의 극소량 DNA로 최대 384 multiplexing에 대응 가능한 Illumina® NGS Library를 제작 가능하다. 본 제품은 샘플 종류에 상관없이 fragmentation된 DNA라면 모두 적용이 가능하다 (Genomic, biofluids such as cell-free DNA, DNA from FFPE materials, cDNA). 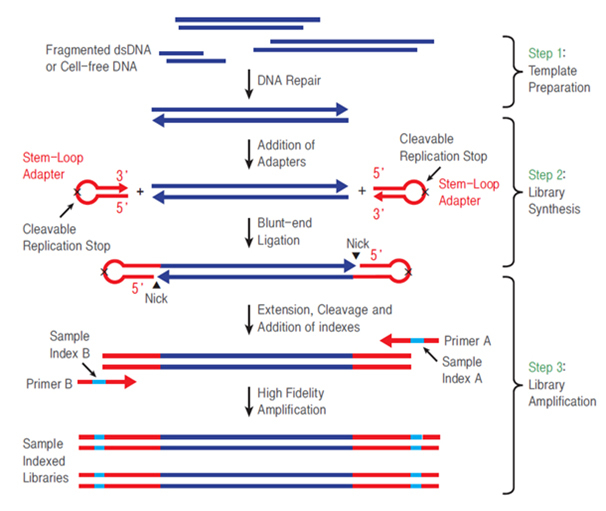 SMARTer® ThruPLEX® DNA-seq Kit을 이용하면 단일튜브에서 튜브 이동 없이 2시간 만에 NGS Library를 제작 가능하다. SMARTer® ThruPLEX® DNA-seq Kit은 다양한 DNA-seq application과 RNA-seq을 위한 cDNA 그리고 ChIP-seq 등에 사용될 수 있으며, 주요 target enrichment platform protocol도 함께 제공되고 있다 (※ DNA Target Enrichment Protocol 자세히 보기). Step 2. DNA 절편의 5’ 말단에 Stem-Loop adapter가 ligation되며, 3’ 말단에는 nick을 남긴다. 이후 extension 과정을 통해 Stem-Loop adapter의 일부가 제거된다. Stem-Loop adapter는 노출된 단일가닥이 없고, 5’ 말단이 block되어 있어 adapter간의 dimer 형성이 억제될 뿐만 아니라 서열 분석에서의 background를 감소시킬 수 있다. Step 3. Illumina® index가 포함된 primer로 증폭하여 Illumina® NGS 분석용 Llibrary 제작을 완료한다. * 자세한 내용은 사용자 매뉴얼을 참고하세요. * 링크를 클릭하시면 SMARTer® ThruPLEX® DNA-seq Kit의 다양한 실험 데이터를 확인하실 수 있습니다. All-purpose low input DNA library preparation fo..
cell-free DNA library preparation for Illumina N..
Illumina® NGS Library Preparation with Unique M..